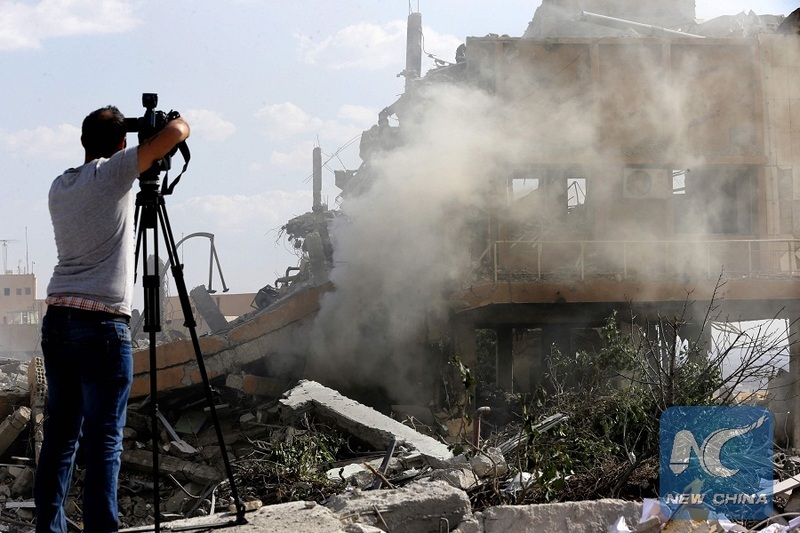 TEHRAN, April 15 (Xinhua) -- The U.S.-led attacks on Syria's weapons capabilities on Saturday sparked mixed responses from the Iranian media on Sunday. Javan Daily published an article by Rahim Lari entitled "Much Ado About Nothing," stating that the one-week hype about the attacks on Syria over the alleged chemical use by the Syrian army ended in an egression on the targets in the Syria. However, "it cannot be called a remarkable military operation." Besides, the indifference of the Syrian President, as he was stepping into the presidential office following the attack on Saturday, indicated that "the symbolic invasion of the United States and its allies has not been able to affect the political and military situation in the country," Lari said. Another article by Mohammad-Javan Akhavan in the daily follows the same suit and describes the U.S.-led attack as the West's reaction to the recent failures of the "terrorist groups" in the country. "Therefore, the attack seemed to be more of a show and propaganda rather than a strategic military operation," it said. Kayhan Daily's article "Trump's Cowardice May Cost Him Dearly", stressing that "Syria, which succeeded in shooting down most of the missiles fired by the U.S. Britain and France , has made it clear that these acts of state terrorism will not go unpunished." The article added that Syria has the right to acquire state-of-the-art military technology for its defence in order to deter its enemies from such cowardly actions in the future, and its friends will surely help. Ebtekar Daily said in the article titled "Missile Game" that the United States seeks to provoke opposing front, namely Iran and Russia by playing this game. The coalition of three important western countries, Washington, London and Paris could mean that this triangle has undertaken the pioneering military role in the Mideast, it wrote. Kayhan Barzgar, the professor of International relations, comments on the invasion and wrote in his article "The Show of Western Solidarity" in Shargh Daily that the attack was predictable but its primary purpose was not responding to the alleged gas use by the Syrian army, or to change the military equations in the field in Syria. "It was basically a show of western solidarity and power seeking to pronounce their control over the state of affairs in the Mideast region," it added. In the meantime, the West is fully aware that they could not be able to manipulate the full-scale operations and control its consequences in the Arab state, therefore they preferred to choose a "limited operation" to bring together the splitted western camp, Barzgar said. Another important point about the results of the aggression for the United States, Britain and France is that they would satisfy their regional Arab allies and, in return, will be awarded with further economic opportunities, he wrote. Ettela'at Daily wrote in the article titled "Aggression of the U.S., Britain, France, with no Achievement" that the tripartite attack on Syria ended without "any achievement" for the aggressors. The attacks on Syria followed the failures of the United States and its western allies in pursuing their policies in the country, it said. Besides, the Attacks did not inflict much damage on Syria and could not influence the state of affairs in the Arab state. Iranian political and military officials on Saturday strongly condemned the U.S.-led strike on Syria's military facilities.